There has been 3 years. 3 years of joy and happiness, 3 years of having the most beautiful feeling in life. 3 years since my beautiful daughter saw the light of this world. Happy birthday my love, Irina. With such a special anniversary should have come a special event, and that was her birthday party. To a birthday party, the key element is of course the birthday cake. It had to be special. It had to be unique. I asked her first what kind of cake she wanted. Her answer was somehow obvious in my mind as well: a doll cake with a pink dress. I was noticing that my daughter liked Tinkerbell movies very much and I thought that it would me nice that the party have a theme. So I was thinking that Tinkerbell was a good idea. 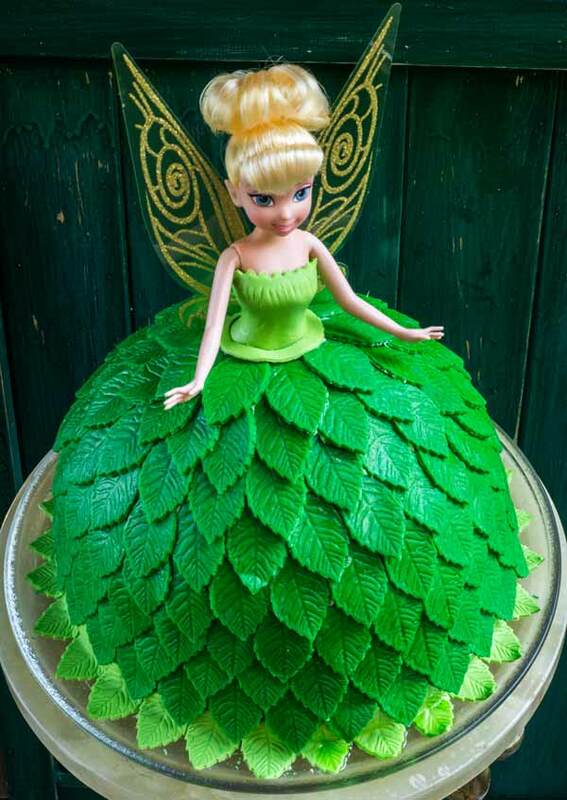 A Tinkerbell theme required also a Tinkerbell doll cake. 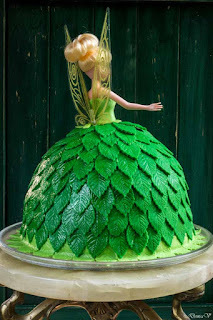 Then I had a dilemma: how to combine a pink doll cake with Tinkerbell? Should I have done a Tinkerbell with a pink dress... at the limit if my daughter would have insisted so much, yes I would have gone to this option. But I have come with a better idea....what if we would do the cake pink inside. I showed to my daughter a picture of a similar cake in green of the one I wanted to do and she liked it so much that she agreed. I proposed her to make the interior in pink to not ignore her pink wish and she said yes. Perfect! It had to be perfect so I have to recognize that I had been a bit nervous before. First of all I have found the recipe, a cake with raspberries to insure the pink color inside. The cake should not have been very sweet and not so unhealthy as it was meant to be for kids. A mascarpone cream was my first choice. Then I went for the options of the dress: marzipan or sugar paste. I have been done marzipan decorations before and I was tempted to try the sugar paste, so I went for this. But also here, I picked not to buy it but to do it myself. The reason was simple: when you look at ingredients of sugar paste that you buy from shops, the list is a bit scary. So I have found the recipe for homemade sugar paste and made a try. The trial went well so I made my decision to go for it. When the time to make the sugar paste for the cake arrived, the end result was not that perfect as it was for the trial, being a bit too difficult to work with it. Another issue I had was the food coloring. I had a package of food coloring of 8 colors. Exactly the green one was missing. What could I have done with it is still a mystery. So, I had to urgently go for a new one. And the new one was lower on quality than the one I had before in the sense that the pigment was not that strong and I had to use the entire tube for only 1kg of sugar paste. More, even when we were eating it on the cake, our tongue and your lips were turning green. Oh well, I will never buy that brand again but it served its puprose well this time. 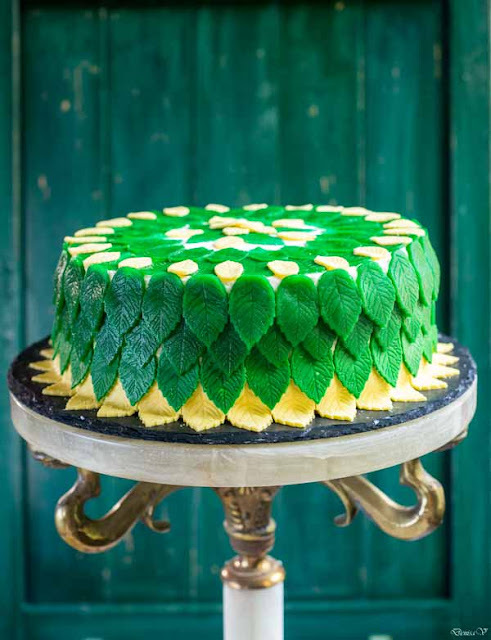 So, I made the sugar paste, I made it green and the next day, on Wednesday I did the leaves. Around 250 leaves. In one night, even if it was kept in a sealed container, the sugar paste dried more and it was even more difficult to work with it. It was suppose to be able to store the sugar paste for 3 months in a sealed container, but it was definitely not the case. However, I succeed to make only 250 leaves because it was too late in the evening. I should have done more. On Saturday, the sugar paste became tough and when I was trying to roll it it became granular. I was not able to shape it anymore. In that moment, I simply decided to throw it away. My sugar paste recipe was good only to use it fresh. Then, the problem was that I needed more leaves. My salvation came from a piece of marzipan that I was having as a reserve in my cupboard. A bit of green and I managed to finish my second cake to decorate. Yes, the second cake, because I made 2. With a big list of guests I thought that one cake was not enough. My plans were right but 2 families cancelled in the last moment because their kids were sick. And finally, I remained with an untouched cake at the end of the party. On Friday evening, it was the time to bake the sponge cake. I went for a recipe that I did many times. It raised nicely in the oven but the bad surprise was that it went down when cooled. The semi-sphere one looking like an old used hat and wrinkled and the normal one looked like a mushroom. Well, I did not restarted the work and I chose to repair them with the help of the frosting. And it worked well. However, next time I would better try another recipe for the dough that is keeping more its shape after cooling. On Saturday evening my Tinkerbell doll cake was ready. On Sunday it was the party. However, m story didn't stop here. I safely put the cake inside the fridge and waited for the next day. On Sunday morning I was planning to make it a photo shoot. Just that, when I have opened the fridge the next day I had a shock: a tray of water has leaked over the cake. I noticed that on top of the cake on higher layer in the fridge, a box that was taken from the freezer has condensed and the water leaked straight on the dress of the doll cake. I have tried to repair it with some napkins, but the leaves had a model and it was impossible. Also the leaked water had darken the sugar paste and made it shinny. I had however another option: some remained leaves. I had then to replace carefully the affected leaves and everything was as nothing happened. 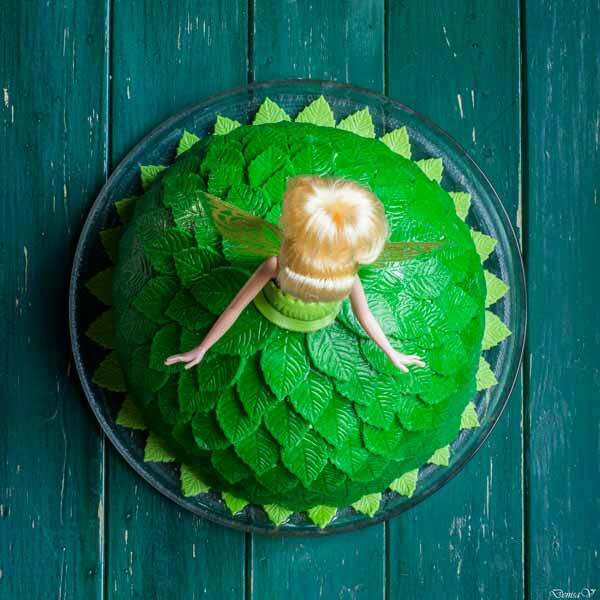 If the skirt of the doll had been from one piece and not from 200 leaves, the cake would have been compromised. I may conclude that this cake was quite an adventure. But each one is because I do not do them so often and every time I try a new version, new recipe and new ingredients. The adventure comes from the fact that you never know how it will be in the end. At the party, kids were impressed with the doll. Parents were impressed of a cake that was not very sweet. But all that matters in the end was that my daughter had a beautiful cake for her 3rd birthday and she loved it. Here it comes the recipe for one cake. Defrost the raspberries and put them in a pot. Press them a bit with a fork and add the sugar. Mix and put them on medium heat. Let them simmer and continue to boil them for 15-20 minutes until the raspberry sauce thicken a bit. Let the pot and the raspberry sauce cool completely. Cut the cake into 3 or 4 layers. Mix the mascarpone with sugar until becomes creamy. Separately, make the whip cream. Add the whip cream into the mascarpone and stir with a spoon until well combined. Now, combine the cake: one layer of sponge cake, pour over the raspberry sauce and add the part of mascarpone frosting. You need to divide the quantities depending on how many layers your sponge cake is. Let a part of the frosting to cover the top and the borders. This will also serve to stick the sugar paste to the cake. The decoration: roll the sugar paste and make a thin sheet. Use a leaf shape to cut the leaves. 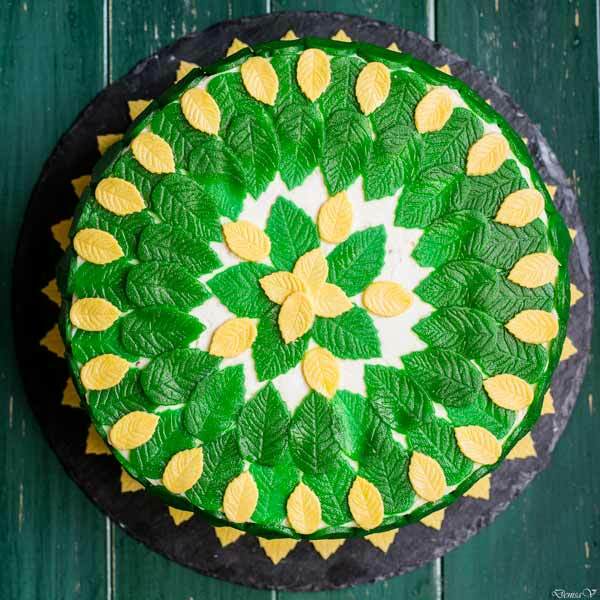 You can do this decoration in advance or in parallel with your cake. do not leave the cake outside the fridge while you are cutting the leaves as the mascarpone and whip cream will melt. 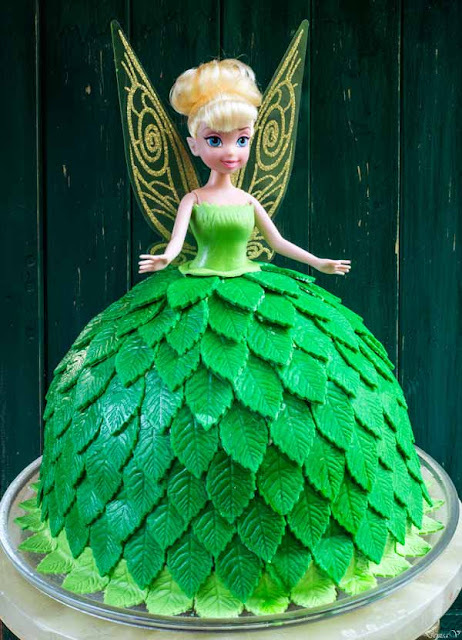 You'll need around 200 leaves for a big Tinkerbell cake. Take the doll and undress it. Wrap her legs into plastic foil. 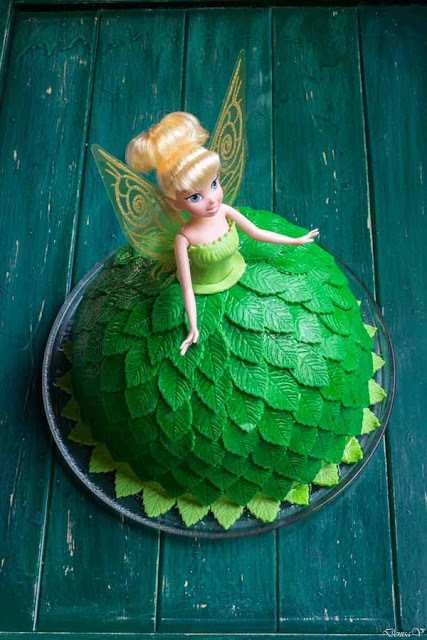 Use a knife to make a little round whole in the middle of the cake where the doll will stand. Decorate first the top of the doll before putting it inside the cake. Put then the doll inside, standing up of course. Start making the skirt, by placing leaves one near another on the bottom. Continue until you reach the top. Cut a ribbon on sugar paste to hide the link between the doll and the cake. Put her wings and here it is. The recipe of the cake was inspired from here. Decoration was inspired from here. Super cute decoration and unique too! Looking for a suitable event space Atlanta for my daughter's birthday treat. Little one is insisting me to enjoy it with classmates and neighborhood friends. Return gifts, décor, her dress, food snacks, juices, cake and many more things are still to be finalized.